Changes to the liturgy are taking effect this weekend. The new English translation is designed to be more consistent with the original Latin. 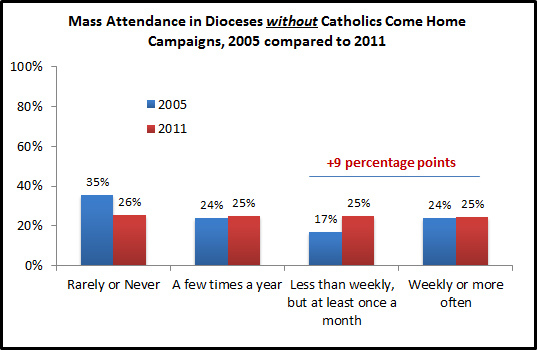 Where are American Catholics on the issue of change in general? 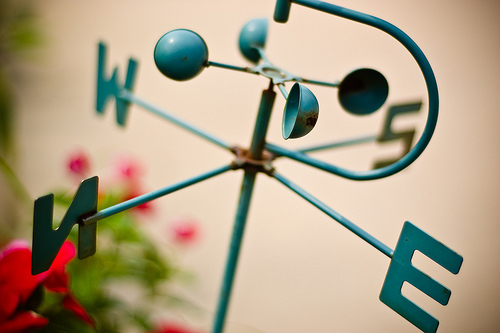 It’s a mixed weather pattern. A majority of U.S. Catholics surveyed responded that the Church should either “adjust traditional beliefs and practices in light of new circumstances” (44%) or “adopt modern beliefs and practices” (14%). More than a third (35%) indicated that the Church should “preserve its traditional beliefs and practices.” The remainder volunteered another response, didn’t know, or refused to answer. 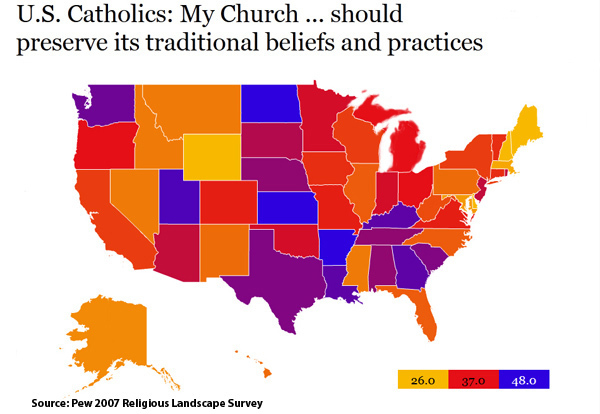 The map below displays the “preserve its traditional beliefs and practices” responses by state. Respondents in states shaded in blue or purple have the highest percentages of Catholics responding that the Church should “preserve its traditional beliefs and practices.” Catholic respondents in states shaded in yellow and orange are least likely to respond as such (i.e., more likely to prefer change). The traditionalists are in greatest number in Kansas (54%), North Dakota (52%), Arkansas (48%), Utah (46%), and Kentucky (45%). 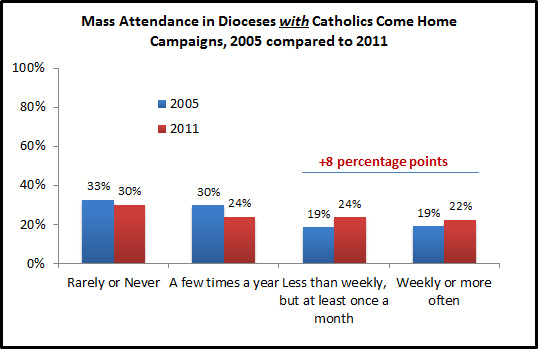 There appears to be concentrations of traditionalism in the South and Central West. The winds of change appear to blow strongest in New Hampshire (23%), Maine (26%), Wyoming (26%), Delaware (26%), and Massachusetts (27%). A New England concentration for change is evident. 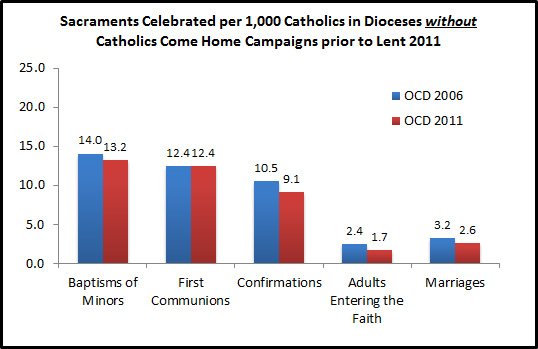 In terms of political and social issues, few Catholics and non-Catholics perceive change. 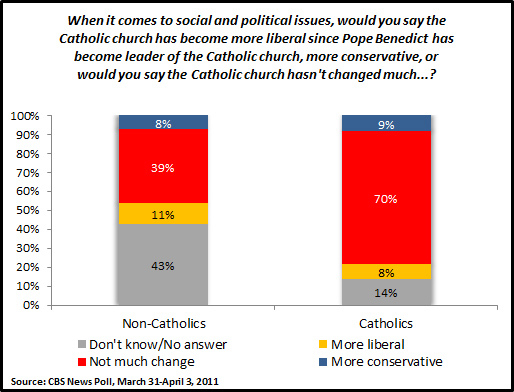 Seven in ten Catholics say there is “not much change.” Smaller and nearly equal numbers feel the Church has become more liberal (8%) or more conservative (9%). Above photo courtesy of Wes Rogers at Flickr Creative Commons.